Passing Daisies: Love from Foodie Pen Pals! 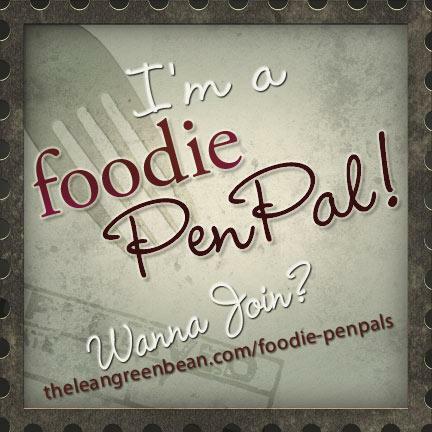 Love from Foodie Pen Pals! First of all, I would like to give a huge shout out to my Foodie Pen Pal for this month - Carrie from Family, Fitness, Food - for working with me. My schedule was a bit special this month because of my spring break, when I was traveling in Virginia and not around a computer most of the week. She was great. Thanks so much, Carrie! You can check out what I sent Carrie by heading over to her blog and taking a peek! 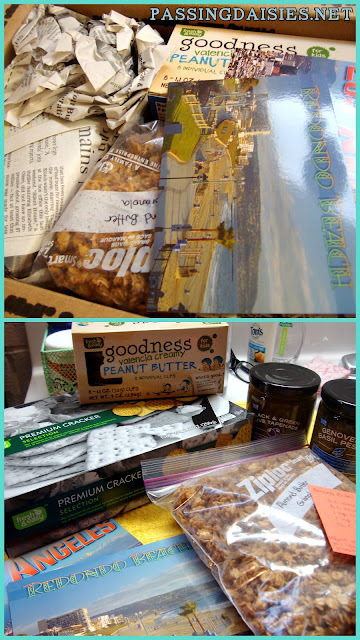 I am always really excited when a Foodie Pen Pal box arrives. This was no exception. In fact, I was so excited that I was trying my hardest to open the box while still in the elevator heading back to my room! Let's take a closer look at what was in the box! First, let's admire those little jars of love. Although I haven't tried the tapenade yet, I love kalamata olives, so I'm excited to try it! The pesto is already gone; I love pesto and rarely buy it because of the price, so this was great! I used it on rice to to make pesto rice, and I tossed the rest of the jar in some soup I made for added flavor. The soup ended up tasting like italian wedding soup. So delicious! Next, I was sent individual packets of all natural peanut butter (how did she know I needed peanut butter?!) and a large box of crackers to use my tapenades and pb on. These were both tasty as well! Lastly, she sent a nice sized bag of homemade almond butter granola! This was really, really delicious, and the bag is nearly gone. It is great with some vanilla flax milk and berries! 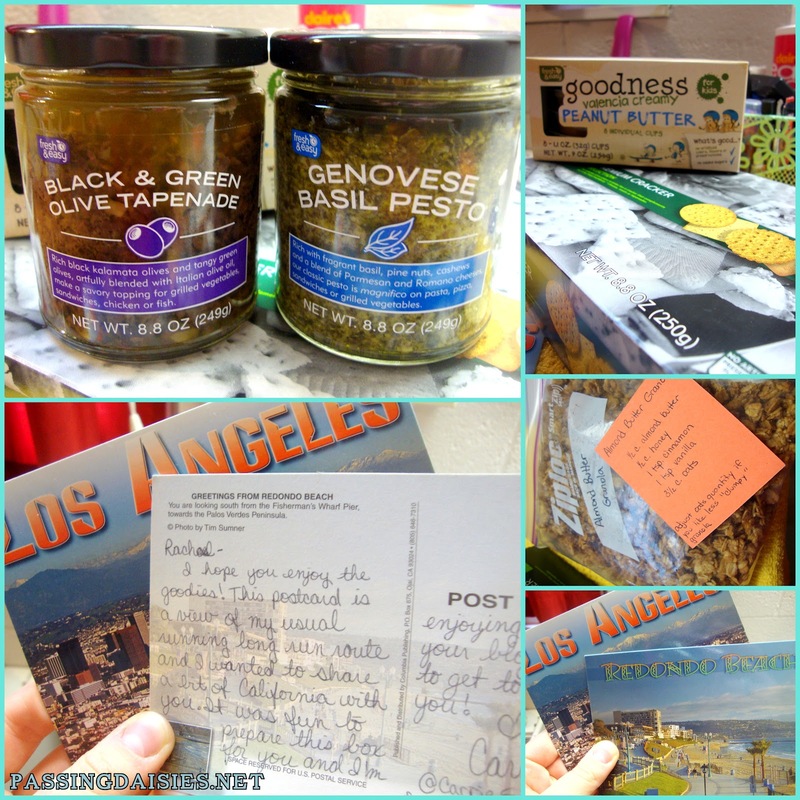 She also sent some postcards of where she lives - Los Angeles! - and one was a picture of the beach where she runs. How awesome is that? Thanks, Carrie, for the great package and for being such a good sport about working with me this month! -Foodie Penplas is open to US & Canadian residents. Please note, Canadian Residents will be paired with other Canadians only. We've determined things might get too slow and backed up if we're trying to send foods through customs across the border from US to Canada and vice versa. So, I'm going to keep two separate lists and match US w/ US and Canada w/ Canada! -WHETHER YOU ARE A US RESIDENT OR CANADIAN RESIDENT. - this is SUPER important so you get on the right list! I'm so glad you enjoyed your box. No problem working with your schedule. It was fun to do something different and exchange boxes with the same person. It was fun to shop for someone living at college. That's why I went for the pb. I thought it was good 'college' food. So glad you enjoyed everything! i'm a sucker for pesto. yummmmmm! What a fantastic box indeed. I can't wait to hear if you like the pesto...it looks delicious. Those look like lovely jars of tapenade and pesto - and they came with crackers to eat them from, how perfect!